I came across an inspiring story by Peter Bergman from the Harvard Business Review this morning about his experiences in lending a hand when Hurricane Sandy devastated the east coast last month. As CEO of appendTo, my days and thoughts have been presently consumed with how to build appendTo into an environment that brings out the best in our employees while maintaining our core values. Peter’s post contained one line that resonated deeply with the type of culture I am seeking to build in appendTo. Most of the conventional knowledge of how to manage and motivate people centers around telling people what to do. Vast amounts of precious resources are spent creating alignment and measuring performance. Yet, companies like Github and Valve are examples of a different way. What dark magic have they mastered to create a working environment that is the envy of the wider Internet? Reading Peter’s post made me realize that I’ve ported the habits of the Lazy Programmer over into management of appendTo. Reflecting on this, I can’t take credit for it. As a bootstrapped startup, resources are scarce and we’ve been forced to accomplish more with less resources. As an engineer at heart, I’ve simply optimized the management problem as much as possible to protect my sanity. Simple? Yes. Efficient? Yes. Does it work? Yes. In my experience, Lazy Managers that equip their reports to understand what needs to be done and then support them with the resources to accomplish the task will likely use less resources and have a greater chance of success. 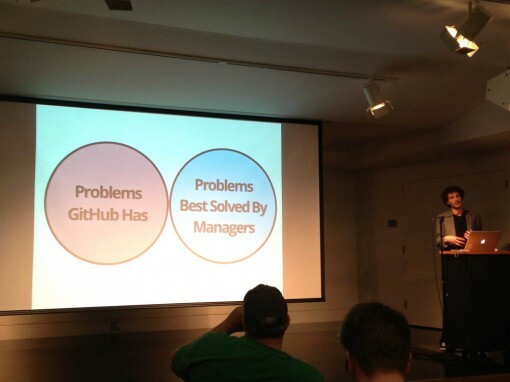 While Github and Valve claim to have no traditional managers, my suspicion is that they may just have a lazy management style, which unleashes the tremendous innovation we see from each company. Think about the best managers in your career. Was your best manager a dictator that micro-managed your task list or was it a manager that equipped you with the problem and partnered with you on the solution. My guess is the latter. 8 Replies to "We need more Lazy Managers"
I agree 100%. I have managed others in the past and took a similar approach, and have noticed myself that the most effective and enjoyable managers are those that let their employees be creative and have input in places without resorting to making them follow arcane processes and hierarchies. Management should take a hands-off approach and trust that their reports have the skill and desire to make the company succeed if they give them the opportunity and resources to let them do it. Great thoughts, Mike! In my experience, I’ve always thrived most (in a professional sense) under leadership that has given me the freedom to own problems, and create solutions. That has always happened with more freedom, not less. One thing I would add though is the importance of leading by example *before* trying to become passive in the process (support driven) – Lazy Managers need to gain their teammates trust and confidence before they can become more of a mentors to their team, otherwise it will feel too artificial. I’m familiar with both books and love them both! Concepts of motivation around the workplace are fascinating to me and Dan Pink does a fantastic job of going into more detail about what motivates us in general. The One Minute Manager is a bit older, but still has some great concepts as well.